Penguin fans—we’ve got some exciting news for you! 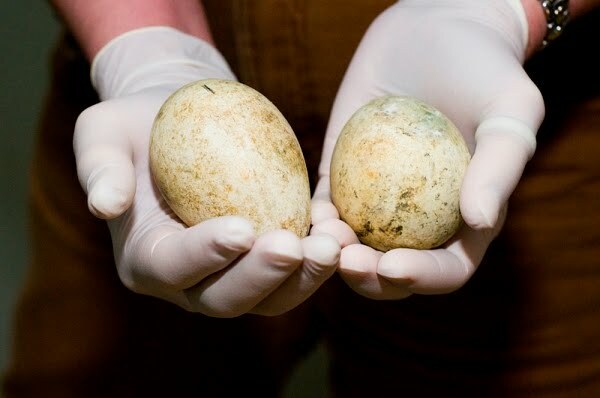 Over the last few weeks, three pairs of Humboldt penguins have been busy incubating two eggs each in the burrows we’ve constructed for them in their new exhibit. 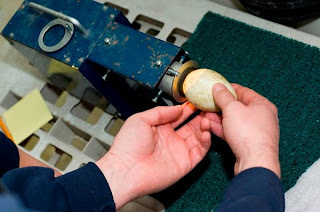 Depending on how far along in the incubation process the egg is, you should be able to see veins after about a week’s time, and should be able to see movement in the egg about half way through the incubation process. 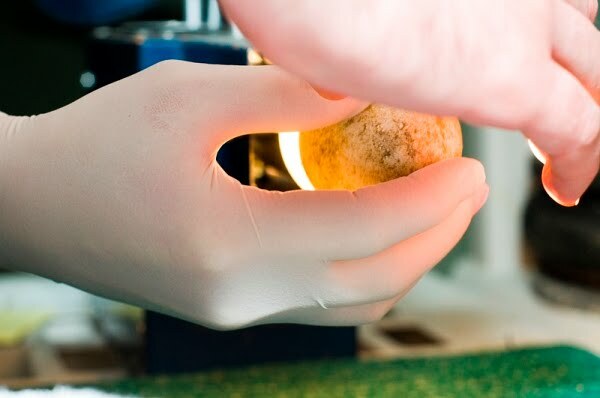 So far, we have candled the two eggs from the first pair on days 14 and 28 of incubation, and progress continues to look good. Incubation is approximately 41 days for this species. If all goes well, the chicks may start hatching soon, and we’ll share updates with you as they develop! A rescued and rehabilitated golden eagle named Ranger will be the newest addition to the zoo’s Raptor Center, and today, he received a full physical examination by our Animal Health staff as part of the standard quarantine process for new animals. Ranger is estimated to be between three and five years old, and has been through a lot in his time. 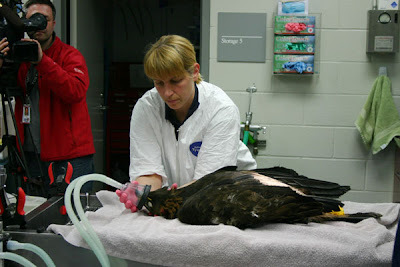 He came under the care of Yakima’s Raptor House Rehabilitation Center in 2008 when he was discovered with wing and leg injuries after sustaining electrical shock and later being struck by a vehicle. He also tested positive for lead poisoning. 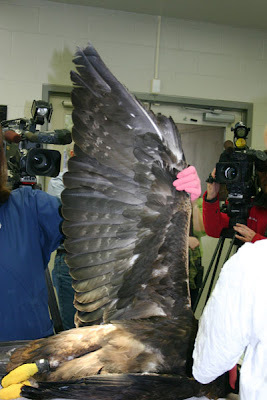 Eagles can unintentionally ingest lead fragments when feeding on animals that were shot. Poisoning also can occur through bioaccumulation when many animals killed by lead bullets are eaten. Due to his injuries, he cannot be released back into the wild, but we’re excited to welcome him to Woodland Park Zoo and to provide him with a safe, long-term home and excellent care. 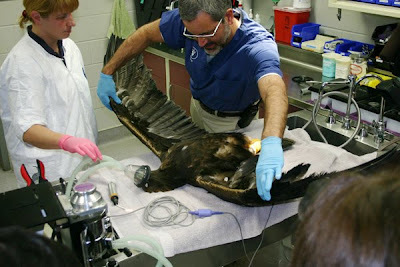 At the exam, the bird weighed in at 8.8 pounds, had blood drawn, received vaccinations and x-rays, and was closely assessed by Animal Health staff. The bird is doing well and will remain behind the scenes for a few more weeks until he is cleared for transfer to the zoo’s Raptor Center. There he will join the other raptors as a conservation ambassador for these magnificent eagles as well as for other wildlife impacted by lead contamination in our backyard and throughout the U.S. 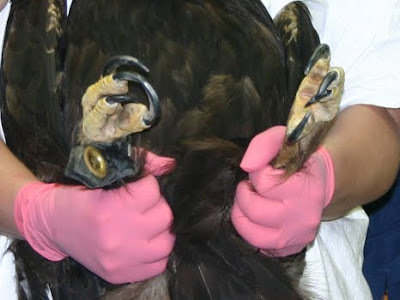 If you are a hunter or know a hunter, you can help species vulnerable to lead contamination, like eagles and other raptor species, by spreading the word that lead is poisonous to humans and wildlife, and taking steps like removing carcasses and gut piles and converting to non-toxic ammunition such as tungsten-alloy shot and solid copper bullets. 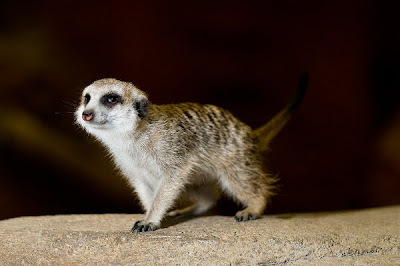 Photos by Ric Brewer and Gigi Allianic/Woodland Park Zoo. Early last month, Woodland Park Zoo Collection Manager Erin Sullivan and I took a road trip for conservation to release captive-reared caterpillars as part of a new zoo program to recover the wild populations of the state endangered Taylor’s checkerspot butterfly. The release into the wild may be the exciting and deeply rewarding climax to this pilot program, but the story begins with the arrival to the zoo of 510 very sleepy, fuzzy black caterpillars that were just waking up from almost six months of diapause (winter resting). The caterpillars were hatched and reared at Oregon Zoo last summer before entering the natural resting period late last summer. At Woodland Park Zoo, the larvae were set up in plastic bins where they were fed, watered, and carefully monitored for about 10 days. During their stay, the caterpillars ate like, well, very hungry caterpillars! Along with my fellow keeper Diane Abbey, we harvested nearly 100 plantago leaves per day for the growing caterpillars. which got big enough to show their fuzzy black bristles and several beautiful orange spots on each slowly growing backside! Why so much fuss over a little caterpillar? Because these ecologically valuable larvae are part of a Washington State Department of Fish and Wildlife and Oregon Zoo project started in 2004 that may be the last hope of saving the Taylor's checkerspot. These native butterflies as adults are beautifully marked with black, orange and cream. They are native pollinators of plants that are in imminent danger of extinction. 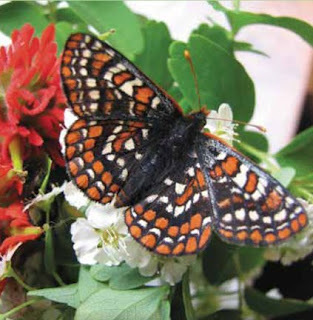 This medium-sized butterfly, the darkest subspecies of Edith's checkerspot butterfly, was once found from south Vancouver Island through parts of Washington to Oregon's Willamette Valley. It needs open prairie grassland or oak balds to survive. Because of the loss and fragmentation of habitat, invasive nonnative plants that out-compete the paintbrush, plantain, and nectar plants needed by the checkerspot, and other lesser known factors, the beautiful Taylor's checkerspot is considered a state endangered species here. By captive-rearing these caterpillars, their chances of surviving to pupation and emergence as adult butterflies are increased significantly. So on their last day at Woodland Park Zoo, each caterpillar was carefully packed, given a few plantago leaves for food, joined me on a little road trip and were then released into a restored area of Puget Sound prairie habitat. Throughout the year, the site will continue to be monitored while they eat, grow, and pupate, eventually emerging as the unique Taylor's checkerspot butterfly— the winged hope for the future of a species! Photos (from top to bottom): Caterpillar at the release site, by Erin Sullivan; Keeper Sue Andersen works behind the scenes with the larvae, by Erin Sullivan; Close up of caterpillar at the release site, by Erin Sullivan; Taylor's checkerspot butterfly, courtesy of Oregon Zoo; Release site, by Erin Sullivan. It’s no secret that much of the forest land in Sabah is being decimated in order to plant palm oil plantations—putting the Asian elephant and orangutan populations in decline due to loss of habitat. 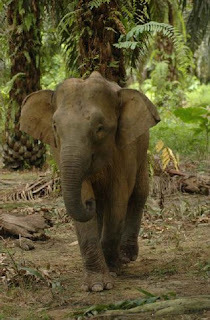 (Pictured below: a young elephant roaming in a palm oil plantation in Kinabatangan, Borneo). In 2008, Hutan began exploring the idea of developing community tree nurseries as an alternative source of income for village families. In May 2009, Hutan gave Hamidin Braim, a villager with experience in tree nurseries, a micro-loan to build a seedling collection center at his home and purchase seedlings from villagers. Hutan and Hamidin gave appropriate training to village families to collect wild seedlings of selected native tree species and raise them in plastic polybags at their homes. Fifteen tree species were chosen, all consumed by orangutans, and known to have relatively high survival and growth rates after being replanted. Thirteen families set up their own home nurseries in 2009 and sold their seedlings to Hamidin’s collection center for a total price of MYR 9,419.80 (USD $2,760). Three agencies involved in forest restoration programs (Sabah Forestry Department, Hutan, and Red Ape Encounters) purchased a total of 6,892 seedlings from Hamidin for a total price of MYR 10,966.00 (USD $3,213.). Although of very modest scale, Hamidin’s initiative proved successful. 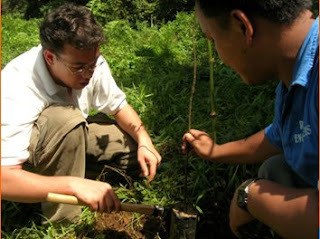 The Sabah Forestry Department has already confirmed that it has recently engaged in large scale forest rehabilitation work in forest reserves of the Sabah interior and that its demand for native tree seedlings will considerably increase for the years to come. 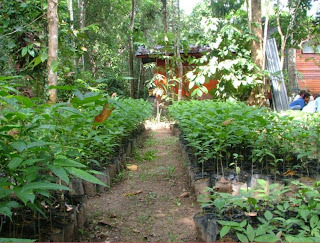 Community tree nurseries seem therefore to be viable conservation-oriented village development initiatives for the Lower Kinabatangan region and we therefore plan to replicate the Sukau nurseries model in the future. Photos courtesy of Marc Ancrenaz.